Wader Quest: Colour ringing information. We often get sent photographs of birds with colour rings on them and are asked from whence they came. Usually we are able to find out and let the person who sent the photo to us know. This photo was taken at RSPB Titchwell Marsh by Les Bunyan. We sent the photo to the powers that be and discovered that it was probably a French ringed bird. Details to follow on further investigation. However we thought it would be a good idea to divulge some of our sources so that should you wish to, you can look them up for yourselves. This fine male Black-tailed Godwit was photographed 30/05/2015 in Lexmond in the Netherlands where it was ringed 24/04/2011. Sadly there is not a single all-species, all-regions, all-projects one-stop-shop for colour ringing codes so it can get a bit confusing. We have created a new page on this website where you can find out as much as we ourselves know about colour ringing projects. We will update this whenever we get new or useful information. 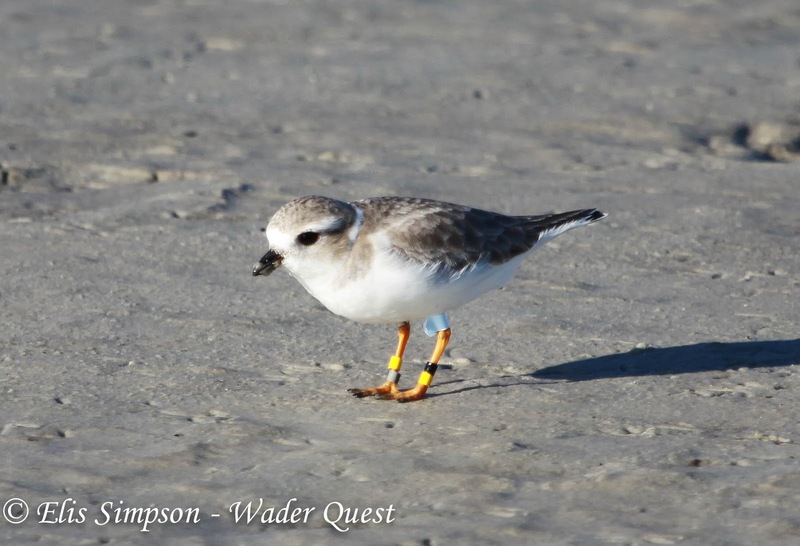 This Piping Plover was ringed as a chick on 16th June 2011 at a lake shore housing development near North End, Dodge County, Nebraska USA (along the Lower Platte River). It has been seen on beaches near Fort Myers Florida during the winters of 2011-12 and 2012-13 and photographed at Bunche Beach Florida 02/12/2012.